Long Run to end season, Hever Castle Guantlet. Hever Castle was my final race of 2014 and I was really looking forward to finishing the season well! The water was freezing, 14.9 degrees, but I soon warmed up. My swim felt OK, exited in 2nd around 1minute behind leader. No panic, a 90 km bike is plenty of time to catch up. However, first few miles my legs felt terrible, nothing in them. Maybe 3 middle distance races in one month wasn’t such a good plan after all. I plodded on, just as I started the second lap, I sighted 1st female in front. Thank god I thought, the second lap I felt stronger and found my legs. 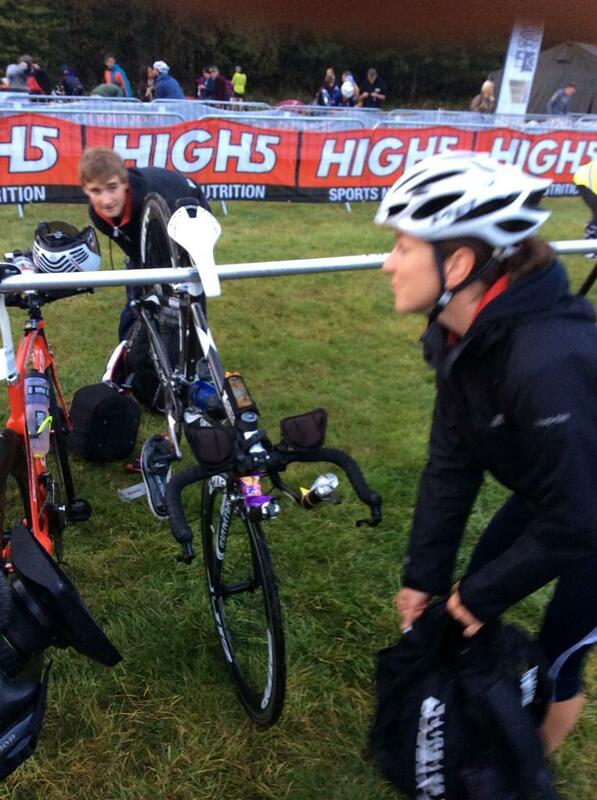 Running through transition into T2 my legs felt heavy from all the hills on the bike course. This would be a long hard run, but I was leading so I just needed to hold it together to take the win, I thought! After running 6 KM, I realised I had been directed to the left on the earlier lap instead of the right, therefore I had run a 5km loop just to come back to the same point where I then rejoined the correct route. This was a real low point, especially as I passed the 3km marker, knowing I had already done 6km! It would have been very easy to have stopped at that point, I didn’t know what position I was in, I felt very tired, and had lost 1st place position. I knew finishing the race in the situation I was in would be a challenge, and If I could do it would make me a stronger athlete. So onwards I went, surprisingly feeling better every mile. With about 5 km to the finish I passed 2nd place, but couldn’t catch first unfortunately. My feelings are mixed about the race. I am pleased to have battled on even though I thought I had lost the race completely. I have gained confidence in my running, managing to run 26 km and feel stronger throughout. But obviously very disappointed not to have won, when I deserved it. Yesterday I completed my 4th half of the year and felt stronger than on all the others. Saturday afternoon the sea was calm and inviting, Sunday morning, quite the opposite! Wave after wave crashing into shore, it was going to be a very tough swim! The horn sounded, I ran into the water, after two strides I was knocked over by a wave and so started swimming. I could not see where I was heading, as every time I looked up I was faced with a huge wave. Probably like everyone in the race, I went off course several times, it was inevitable! I was second female onto the bike, and soon moved into first place. It was all going well until my tri bar came lose at about 60 KM. This made it difficult to maintain an aero position, and changing gear was tricky because the gear lever was on the end of the hanging tri bar. I can only blame myself for this, as I had rebuilt my bike after a flight several days earlier. My bad! Pleased not to have crashed on the bike, I began the run feeling fairly strong. My father shouted a time check between me and second place, 8 minutes. It sounds a lot, but the run course was 15 mile, and 8 minutes can easily be caught. With this in mind, and the fact that I’m never 100 percent sure that my father’s timings are accurate, I picked up the pace. It was a risky tactic because I still had over 8 miles of running left. Luckily I didn’t blow, and held a good pace to the finish. One more race left this season, The Gauntlet at Hever Castle. This year my Father, Sister and Brother are racing the relay and hoping to beat me. No chance, hahaha! I had a great race at Eirias Half, winning the race overall! The swim was fun. The sea was choppy, which makes it more interesting and challenging. I exited the water in 3rd, sped through transition and came out first on the bike. I loved the bike course. It started with a 10km “King of the Mountain” and then gradually descended back down to sea level. The views were amazing. I led the bike until the final stretch of the first lap, I was gutted to be overtaken! I finished the bike in 2nd place, hoping I would close the gap on first place throughout the 13 mile run. After a strong run I crossed the finish line in first – I have never won a race overall before! 3 litres of ERDINGER Alkoholfrei poured over my head soon refreshed me, ready for the 5 hour drive home! The Welsh Sprint Championships were not on my list of goals for 2014. My main goal was to go to Glasgow, then after this, to concentrate on middle distance races. With three middle distances races planned for September, I wasn’t sure if I could afford the time to race in the Welsh Champs. But, as it was on my doorstep, I decided I would use it as a hard training session in preparation for the middle distance races. I was surprised to find myself within the top 6 exiting the water, very close to Zoe Thomas, who usually swims far faster than I do. I felt confident on the bike and worked hard to put myself into second place going into the 5km run. My first thought was “I wonder if I can win this race overall again?” Determined to catch the lead runner, I went off as fast as I could. By half way we were running together but I managed to open a gap with about 1.5 km to the finish. What a great feeling to win the Welsh Championships! Sorry men, you were all chicked again! 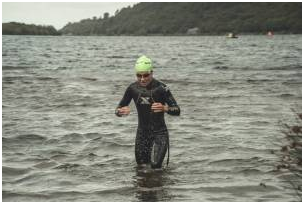 I raced the Brutal 10km Swim last Sunday in Llandberis, North Wales. It was far tougher than I was expecting but everyone loves a challenge, don’t they!After a night of wind and rain in my two man tent, I didn’t relish the prospect of getting in the cold, deep waters of Llanberis lake! When I arrived at the lake there were several crazy people swimming without a wetsuit! The race briefing explained that we must complete 8 laps in total, and must exit the water after every 2 laps. I thought this was a bit excessive, having a break every 2.5km. However, after 2.5km I was more than ready for some flapjack and a drink! Three and something hours in the water is a very long time, and many thoughts drifted in and out of my mind – “I wonder how deep this lake is”, “why do I do this”, “what will I eat when I finish”. At about 7km I began to struggle, the waves seemed to be getting bigger, I was swallowing more water and my arms were getting heavier. Next food stop I had flapjack, jelly babies and jaffa cakes! This was probably one of the hardest things I have done in my life, but I love to push myself through a good old challenge! 15km next?